My Little Chickie hooded towel gift set is proudly made in the USA. It is made from a premium quality terry velour fabric that's both incredibly soft to the touch & super absorbent. This is an over-sized towel (28" x 44") designed to wrap baby in after bath. It is also large enough for use by a toddler. Three 8" x 8" terry washcloths are included. An adorable "My Little Chickie" embroidery design is featured on the hood of the towel. 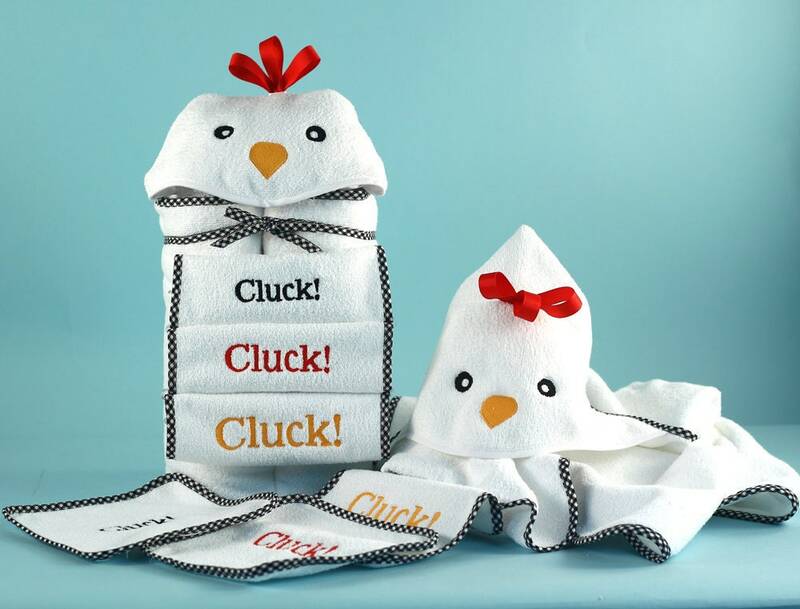 Each of the washcloths is embroidered with "Cluck!" to coordinate this lovely baby gift. All items are presented in white terry, with fashionable black & white gingham trim. My Little Chickie Hooded Towel Set ships gift wrapped in clear cello with ribbons & bow. Hooded Towels can be ordered personalized too! The name will be embroidered on back so it is visible when baby is wrapped in towel. Please enter the name in the space provided or the Notes/Comments box during checkout.